This Easy-to-Transport Truss Puts Your Lights Where You Want Them! From rock shows to DJ sets to wedding bands, a sweet lighting setup is that final element that takes a great performance and makes it unforgettable. Music goes a long way to set an emotional backdrop, but the right lighting transforms any space--small club, event hall, backyard--into a live performance temple, and gives your audience permission to completely lose themselves in the moment. If you've been thinking about adding lighting effects to your live sets, but are worried about a reliable solution that will fit your budget, have they got good news for you. The LS7730 Light Stand with Truss is a rock-solid, lightweight, and low-cost solution for mobile or temporary lighting setups, and it's available through zZounds for a price that will fit any budget. While it's good to project an element of danger via your stage persona, actual danger via your lighting elements is best avoided. 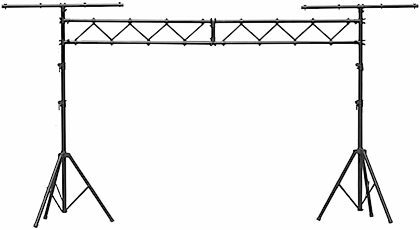 The On-Stage LS7730 easily supports up to 200 pounds of lighting equipment, and with a tripod base width of 48", it'll take a direct linebacker tackle to bring it down. Even at its full 11.5-foot height, the On-Stage LS7730 is a reliable stage partner. Yet the entire assembly folds down to fit in a lighting gig bag and weighs less than 35 pounds for maximum gig-ability. Do you have, let's say, sixteen lights? You're in luck: the On-Stage LS7730 can hold your entire collection! The main horizontal truss can expand out to 10 feet across, accommodating up to eight par-cans to help you spread light all around the stage. Additionally, atop each stand is a "T" bar that can hold four more cans each (or other special effect devices like dynamic LED or laser units). A fully-loaded, fully-extended On-Stage LS7730 at the back of a stage and at its nearly 12-foot elevation is truly an awesome sight to behold. There's a lot you can do to impress an audience, but if you want to make each gig unforgettable, you're going to have to take your show to the next level. Let zZounds and the On-Stage LS7730 help you get there. The On-Stage LS7730 lighting stands with truss is a low-cost alternative that can hold a total of 16 PAR cans! LS7730 includes two tripod base lighting stands with 3 section shafts, T-bars, and two 5 feet Truss sections. Easy assembly for traveling musicians, the On-Stage LS7730 comes with screw on plastic brackets and thumb screws which allow for quick height adjustments. Use only for static lights. The On-Stage LS7730 lighting stands with Truss is a complete set to get started on presenting your show! Overall: I'm a beginner mobile DJ with a decent budget to spend. This is my first stand/truss and it suits me well for the time being. Holds my lights and has plentry of room for more. I have the jellydome for the center piece and a REVO III on each side, also lasers on each side as well. It supports well, no bowing, easy set up (possible with one, two is better). Even though its a truss, the extension bars can also allow you to use it as two seperate T-stands if the venue wouldn't work with using it as the truss. The unit is very transformable, lightweight, easy to assemble, idiot proof really. I really like this truss system and don't see it being replaced anytime soon. Overall: Just got these yesterday, and I know I will get lots of use out of them. These things are built to last. Had previously bought a different set from someone else; total waste of money compared to these, wish I had seen these first. Style of Music: Styles are Rock and Country.